Peace Ambassadors of West Texas, a multicultural study group, meets once week at Emmanuel-San Angelo, Texas. I was privileged to spend a few hours with them last week. Shown here with their patron father of three faiths — Islam, Judaism, and Christianity — Abraham, are members Ara Rahman, Becky Benes and Valerie Queen. The group was formed in 2004 to facilitate conversation between persons of different faiths about living together peacefully in the world we share. Their table is a place of compassion and understanding, and a model of living gracefully in a divided nation. If San Angelo is an oasis for West Texas, this group is a headwater from which that radical hospitality flows. This week the Holy Spirit moved us from lovely San Angelo westward to Fort Stockton, Alpine and Marfa, Texas. I had the opportunity to share what EPF can do to support parishes and peace partners with St. Paul’s-Marfa with their adult Christian Education class, and then to preach at their Sunday morning Eucharist. One of the downsides to preaching is that when I am talking, I am not learning anything. 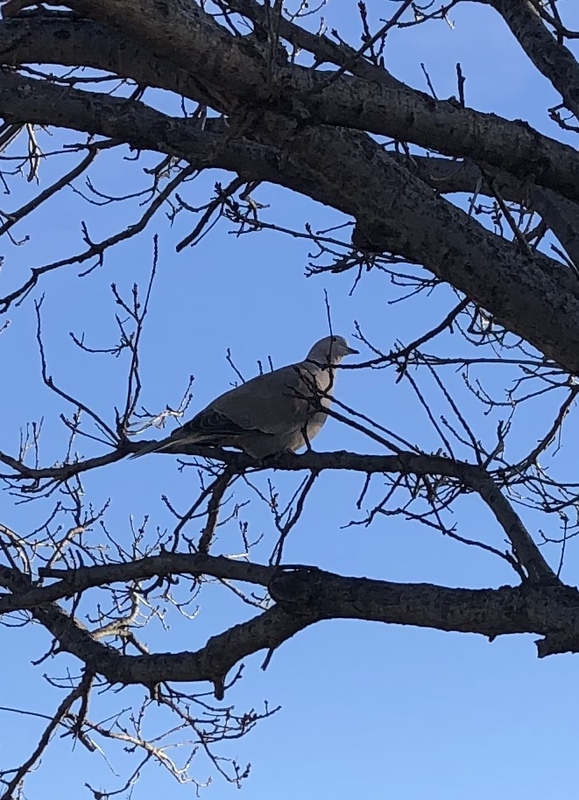 I’ve learned a whole lot by being quiet and listening as I have been on the road since Epiphany Sunday, including that there is a season for nonviolence, and that we are in it, right now. It seems that in 1988 the Association of Global New Thought (www.agnt.org) declared the days between January 30 and April 4 (the dates of the martyrdom of Mahatma Ghandi and Rev. Dr. Martin Luther King, Jr) to be the Season of Nonviolence. It’s not a liturgical season that we recognize in the Episcopal Church, but it seems worthy of mention here. I hope it’s a season we can adopt for purposeful action in the coming years through EPF. 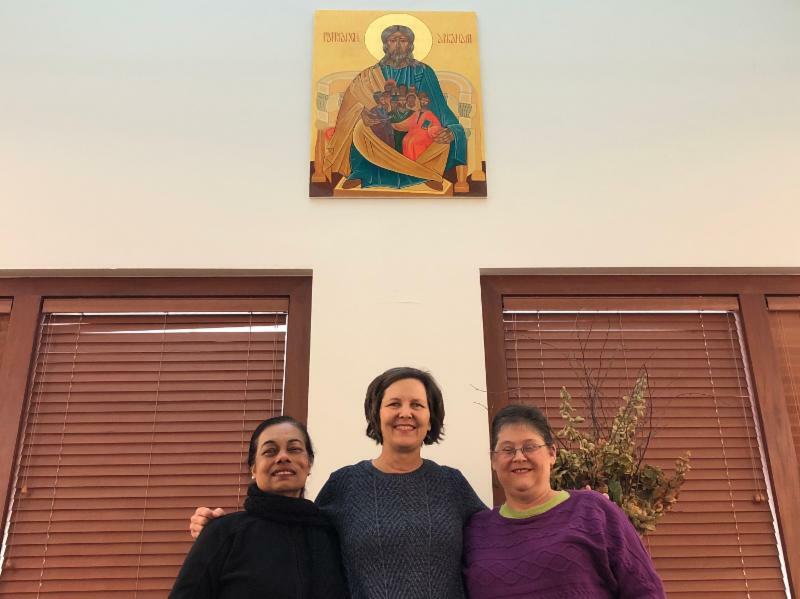 What I did manage to learn at St. Paul’s is that this progressive community is interested in and committed to finding ways to show hospitality, kindness and life-giving support to those struggling to find safe harbor in our country. In fact, St. Paul’s vicar, Rev. Mike Wallens, has already participated in the Border Ministries Summit (comprised of representatives from all the Episcopal Dioceses which border Mexico) held in El Paso last November, and has frequent opportunities to minister to both immigrants and law enforcement. In addition to trying to connect St. Paul’s with resources to empower them to advocate for compassionate immigration policies and to offer hospitality, I hope that I can secure a way for EPF to participate in the 2019 Border Ministries Summit, which will happen in Tucson, AZ this November. I am grateful to St. Paul’s for their warm welcome and generous hearts. 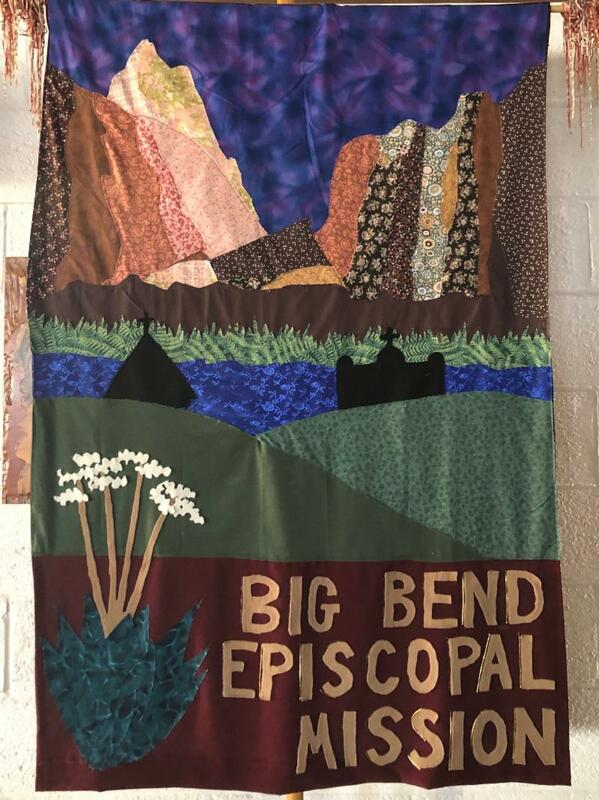 The west Texas parishes of St. James — Alpine, Santa Inez –Terlingua, and The Chapel of St. Mary and St. Joseph — Lajitas Resort are part of the Big Bend Mission in the Diocese of the Rio Grande. Shown here is the lovely banner for the Mission displayed at St. James – Alpine. 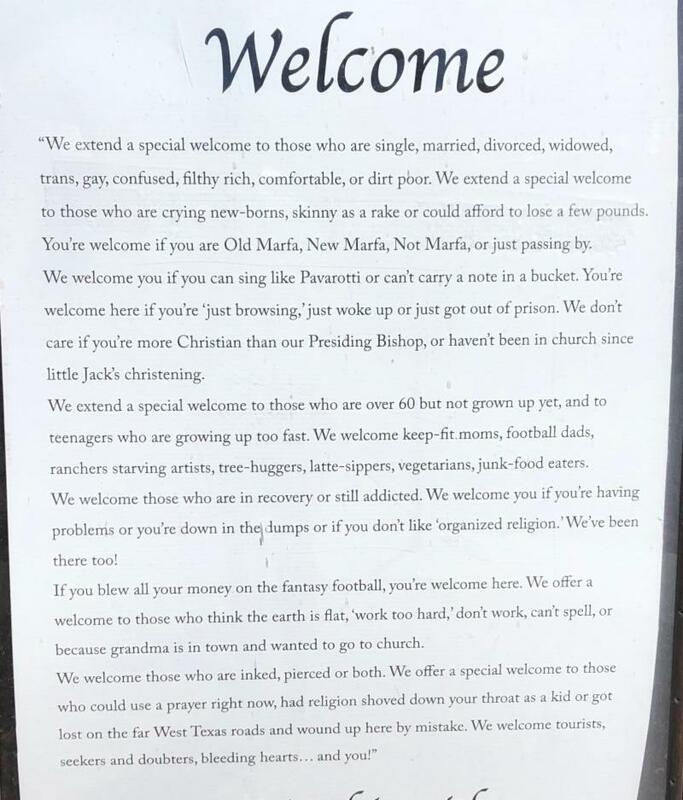 The VERY effective welcome sign which sits in front of St. Paul’s — Marfa. They understand grace! Plan to Walk In Love with EPF in April! 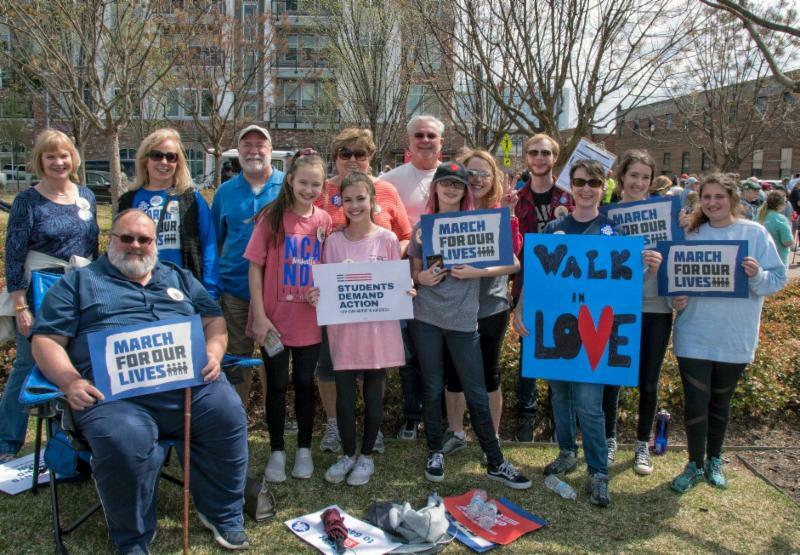 The weekend after Easter (April 26-2), we will make a pilgrimage to Columbine, Colorado to commemorate the horrible school massacre which happened there twenty years ago, and will rededicate ourselves to eradicating gun violence in America. We will partner with advocates against all forms of gun violence, which includes the daily loss of lives in communities across the country due to domestic violence, gang violence, workplace violence, mass killings, suicide and accidental shootings. Preaching on the Sunday of our commemoration will be Lutheran pastor Don Marxhzausen, who was forced out as pastor of his congregation when he dared eulogize, humanize and preside over the funerals of the young gunmen. I hope if any of you are able, you will join us in Columbine for what we hope will be a transformative remembrance. We’ll be heading to Big Bend later this week, then on to El Paso. But first, we will drop by the McDonald Observatory for a star party, and tour the Davis Mountain scenic drive. www.missingpersonsrv.com will have photos, for sure. I hope to visit the ghost town of Terlingua while we are in Big Bend, particularly the parish of Santa Inez. We will be looking for a meaningful encounter with groups ministering to those in crisis at our border with Mexico while I am this far south. El Paso awaits!